“The UN Agenda 2030 is the benchmark for me”, says Tonghoin Pech – economic progress must go hand-in-hand with social justice and responsible ecology. He pursues this challenge in his business studies. The 6-month internship at the United Nations Systems Staff College in Bonn is perfect, according to the scholarship holder. “I’m learning a lot about Agenda 2030 and sustainable entrepreneurship – moving away from business as usual and towards new strategies.” The Bonn college supports the staff of the United Nations and its member organisations through training and further education. The internship within the framework of the Carlo Schmid programme is an award and opportunity for young scientists from developing countries. Each year, up to 10 scholarships are conferred for internships with international organisations. They are awarded to outstanding and committed alumni of the DAAD programme “Development-Related Postgraduate Courses” (EPOS) and financed by the Federal Ministry for Economic Cooperation and Development (BMZ). The starting point for Tonghoin Pech’s research and, the focus of his studies, was tourism. “Tourism is one of Cambodia’s most important industries”, he explains, referring to cultural treasures such as the world-famous Angkor Wat Temple. The country still suffers today from the consequences of war and occupation. Poverty and a lack of education are serious problems. 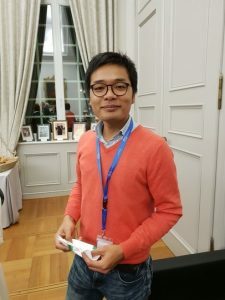 At the University of Leipzig, Tonghoin Pech was enrolled in the MBA programme “Small Enterprise Promotion and Training”. His Master’s thesis dealt with SME tourism companies in Cambodia. After the UN internship, Tonghoin Pech wants to start working towards his doctorate. “Tourism will continue to be an important topic for me in the future”, he says, “but other economic sectors play a role now too”. Decisive is the perspective of Agenda 2030: education and economic structures that lead out of poverty and conserve natural resources. Tonghoin Pech sees his studies and the UN internship as more than just a personal opportunity. He wants to share his experience and knowledge with others. “Since February 2018, I’ve been working as an honorary mentor for an online education project”, he reports. The aim is to help young fellow Cambodians discover their career paths and prepare for their own studies.